Happy Monday, Daisies! 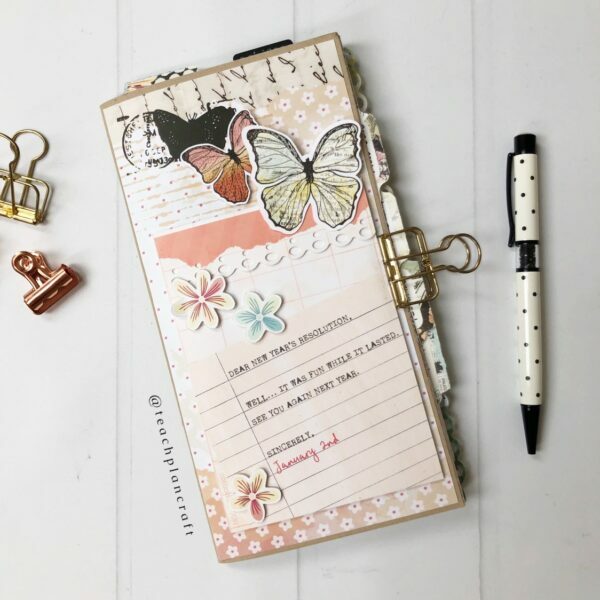 I’m back with you today to share something I’m pretty proud of – my first month using the brand-new Cocoa Daisy Traveler’s Notebook Memory Keeping Kit (TNMK). I’ve been a planner girl for a long time, but I’d never done this type of memory keeping (or really any memory keeping) before, and I admit I was a bit nervous to try. But I was also excited, because it looked like something I could do! 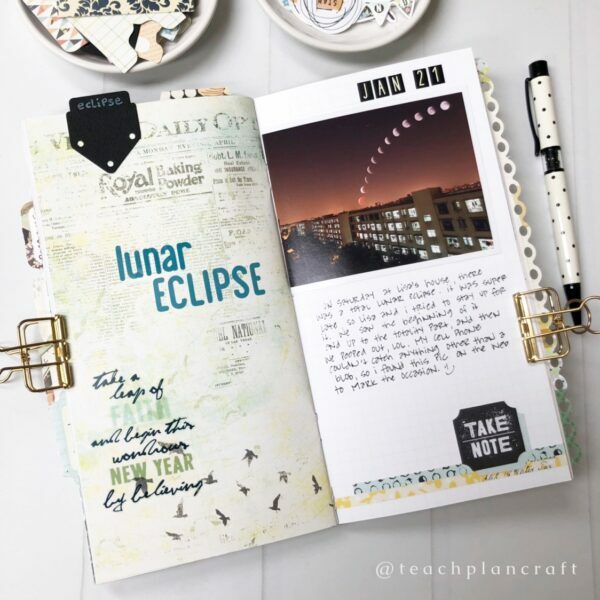 The booklet has beautiful artwork already printed, and the kit comes with plenty of embellishments, so along with the items in my planner kits, I wouldn’t have to worry about going out and buying any extra craft items to be able to use it. 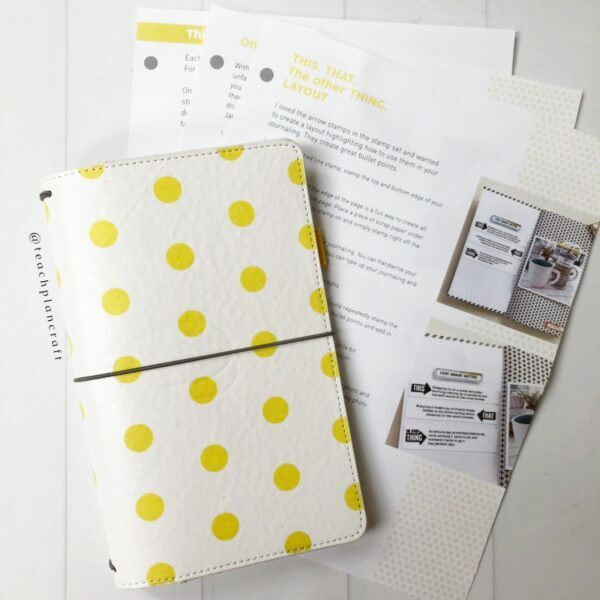 Let’s take a walk through my booklet and see how I did! When I first opened my kit, I was flipping through the booklet, wondering how on earth I would fill up all the pages. I am single and don’t have kids, so unless I put my cat on every page, I wasn’t sure what I would document, haha. To combat that slightly panicked feeling, I decided to start by dressing up the front cover and go from there. I used a large piece of patterned cardstock for the background and layered a dashboard on top with some butterfly and flower die cuts. Simple and pretty. 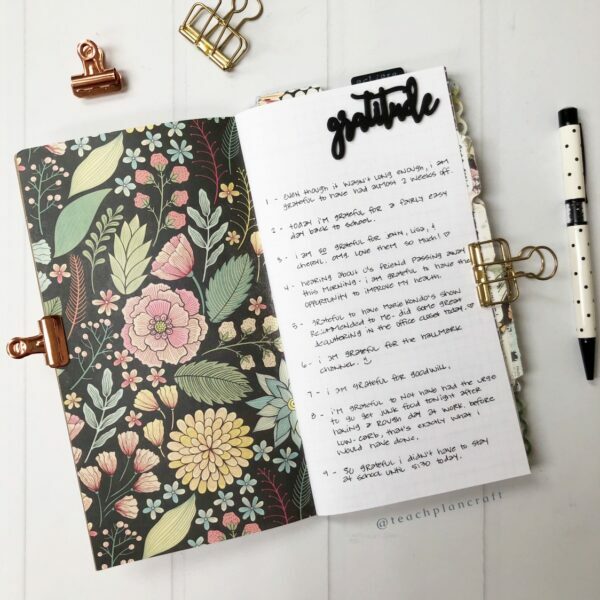 I had already decided that I wanted to move my daily gratitude from my planner to this booklet, so I made the first three pages my gratitude section (and will do this for subsequent months as well). 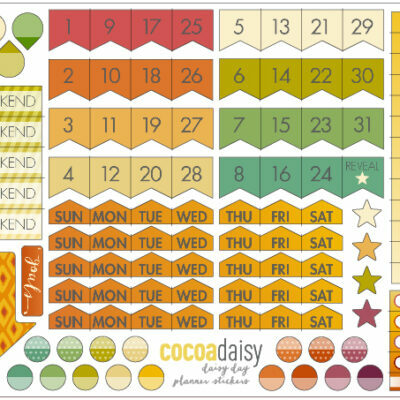 The pre-printed black floral pattern on the left is my absolute favorite Cocoa Daisy pattern of all time, so although I played with adding a die cut here or there, I eventually decided to leave it blank. The foam “gratitude” made a perfect title, and each evening before bed, I opened the booklet and jotted down a line or two. The two pages after this one are both white without decoration, so I was able to fit all 31 days without issue. Since it was January, I thought the next page would be a good place for my resolutions/goals. Unlike pretty much every other year in my life ever, I wanted these goals to stick. Placing them here where I could look back on them periodically seemed like a good way to do that. The right side background was already printed, so I just added a dashboard and some washi, and glued down a couple of die cuts to the paper I added to the left side. Once I was done with those pages, I just waited for things to happen! I had accepted that I might not fill the whole book, so I wasn’t worried about “having” to have enough. But I also told myself I wouldn’t wait for “big” events. If something struck me that seemed worthy of documentation, I would document it. There are few large moments in life, but there are tons of small ones that are just as worthy of remembering. Being a teacher, the first thing that seemed worthy of documenting was the first day back to school after Winter Break. 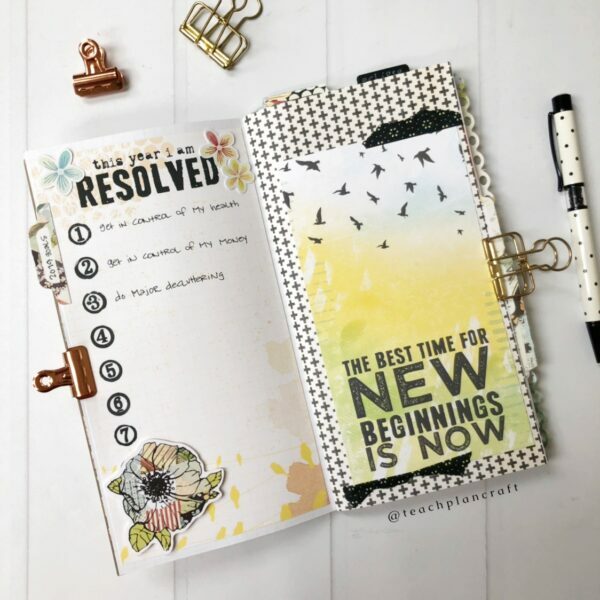 The top part of this spread was pre-printed, so I just added a few strips of leftover planner kit paper, a couple die cuts, a journal card and my photo, plus the date. I was amazed at how quickly it came together, and it gave me confidence that I could actually do this. The weekend after school started, I started in earnest on my goal to declutter the house. I decided to take before and after pics of the office closet, and put them with some journaling about the process into my booklet. With a few stickers, this layout was done in no time. The full patterned pages are an absolute godsend. Our first snow was definitely worth documenting! We teachers get just as excited about snow days as our students, so unlike many of my friends, I look forward to winter, lol. 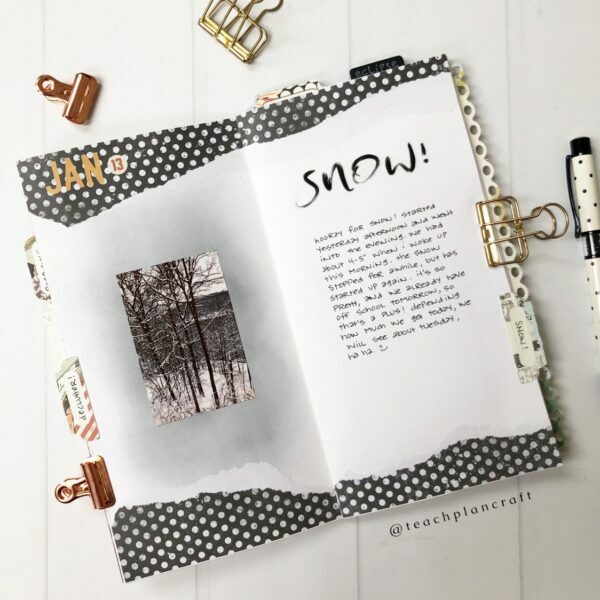 I wanted this spread to be very simple, so I sponged on some of the gray ink in the January kit to make a background for the photo. The black and white paper (the only item I pulled in from my personal stash) added just the right border, and a small bit of journaling on the right side finished it off. 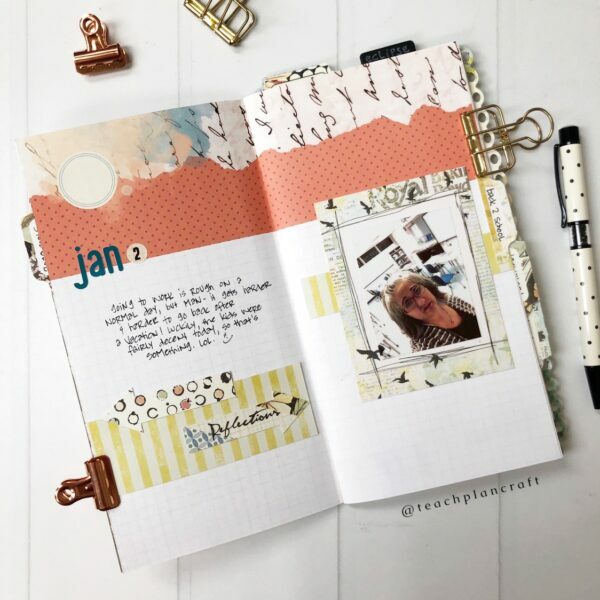 This “currently” page was born from one of the January Planner Challenge prompts, and I flat-out stole this tag in the pocket idea from my fellow planner team member Jennifer Crowder (thanks, Jen!). I left the pre-printed right side alone and just added a few stickers and embellishments to the left side. I like this so much that I may do it in every month’s booklet going forward. The following weekend, I saw my friend Anne, who I used to work with but who I rarely see any more since I switched to a new school. I’ve gotten her hooked on Cocoa Daisy, and she wanted my help setting up a planner for her daughter. We had a good time talking and laughing – definitely a memory worth keeping! Layering a piece of planner kit paper, a journaling card, and some die cuts framed my photo nicely, and I balanced that out with simple journaling and a couple stamps on the left. 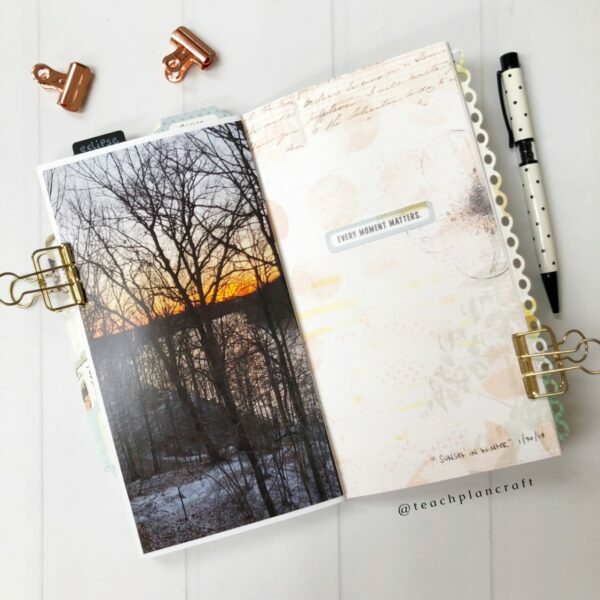 I was struck one evening by the sunset behind my house – winter is the only time I get to see this view, with the leaves all fallen from the trees – and I decided to try Christine’s idea of printing a full-page photo of it. It was surprisingly easy, as all I had to do was type in the dimensions I wanted and print on photo paper. Voila, it fit perfectly! I toyed with putting the die cut on the right page over on the bottom of the photo instead, but in the end I liked leaving the photo untouched. This is the most basic layout in the whole book, and probably the prettiest. I will definitely use this technique again! The last thing in my booklet is a goals review page. I used another foam word, “reflect,” at the bottom left to balance out the title in the upper right, and left the rest of the left side alone. The pre-printed pages in the booklet are just so perfect on their own! 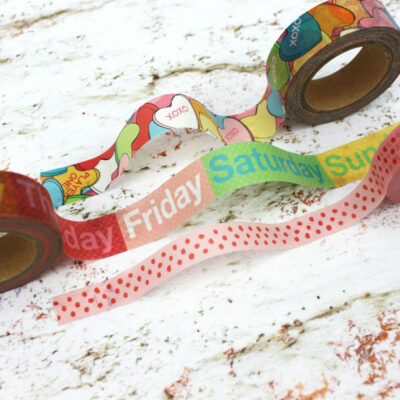 The last thing I want to show you is the instruction sheets that came with the kit – this was a brilliant idea, and I’m so glad Christine came up with it! 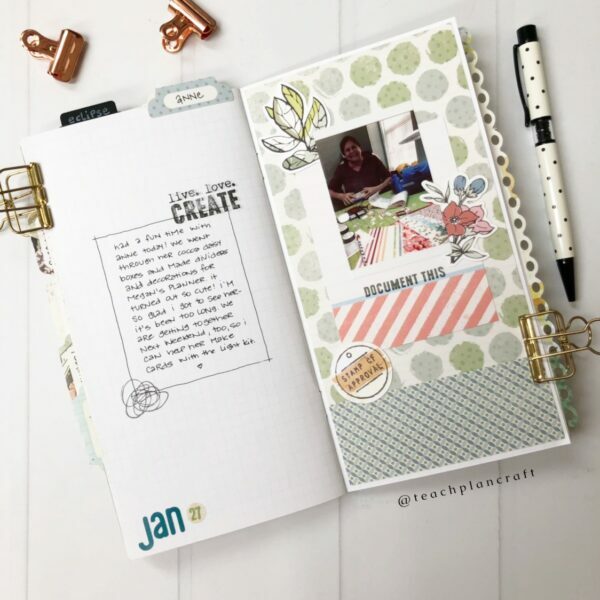 Two of the pages have example layouts that she did, and the third page has a “sketch” – an idea for a layout that shows where to put the photo(s), title, journaling, etc. 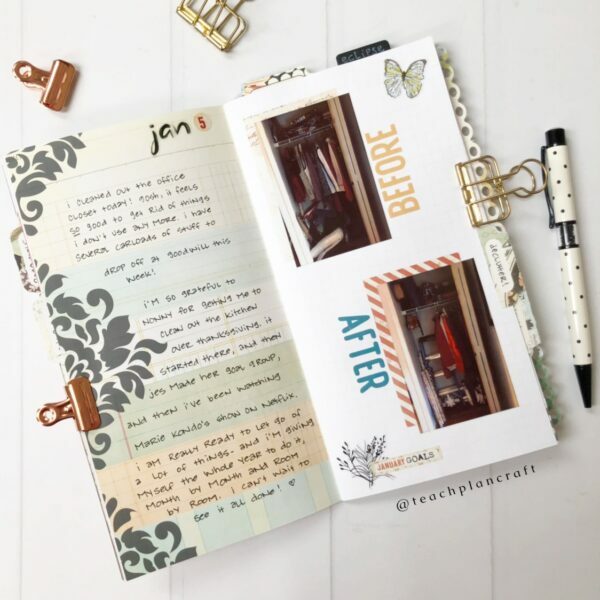 It’s a great way to get started if you are stumped for ideas on what to do with your pages. I’m going to keep each month’s instruction sheets in a 3-ring binder to refer back to. 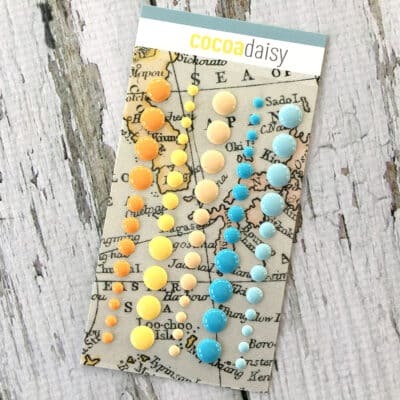 The yellow polka-dotted TN was sold as part of a previous Cocoa Daisy anniversary kit, and I’m planning to store my booklets in there (hopefully 3 or 4 month’s worth). If you don’t have this TN, any standard sized TN will do. So there you have it, a memory keeping newbie’s approach to using the TNMK for the first time. 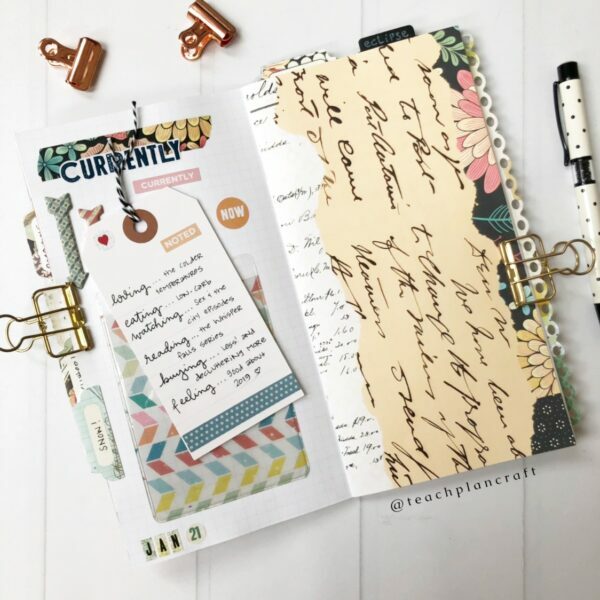 I want especially to emphasize how EASY it was to use – I didn’t spend more than 15-20 minutes on any one layout (except the 2-page one that required a lot of journaling). 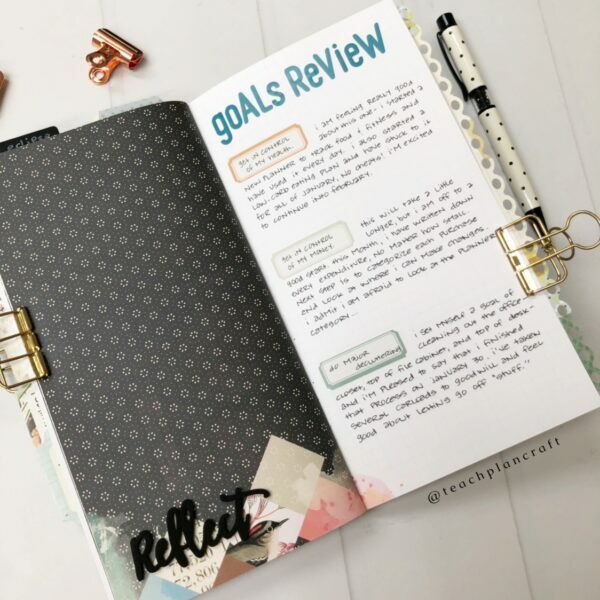 If you have ever thought that memory keeping wasn’t for you, or if you have wanted to do it but felt intimidated by all the picture-perfect spreads out there, I recommend you give this kit a try! Feel free to leave me any questions or comments down below, and thank you for reading today! Simon, Betty, Coffee, YES! Plan with me! Your TN is marvelous Kristine. Thanks for sharing! 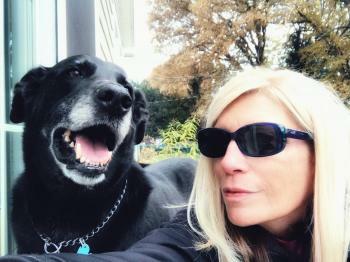 I love your TN Kristine! So inspiring! 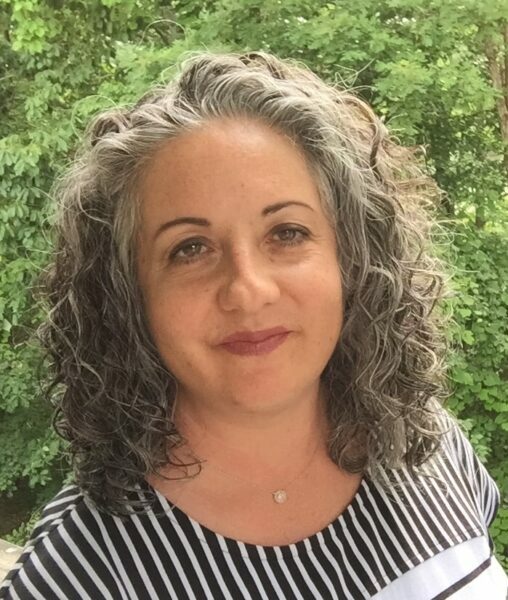 Michelle, thank you so much! The kit was just so perfect, it was hard to mess it up! Loved this post! 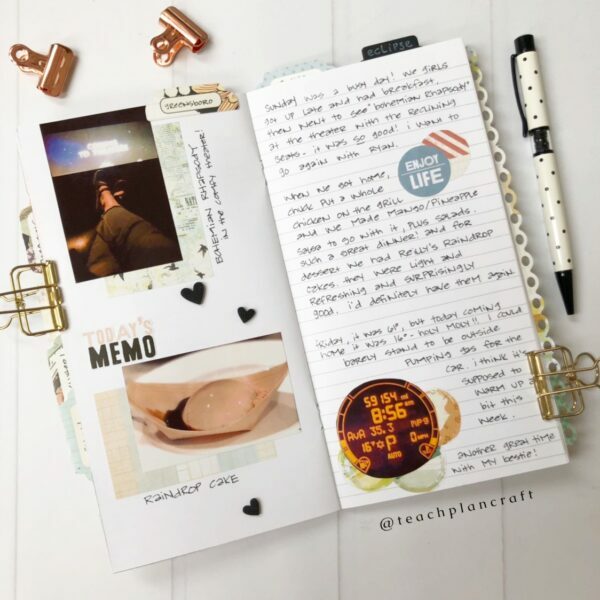 I\’ve been a memory keeper for years, but was a little tentative about how I was going to use the TNMK kit. Thanks for the inspiration! Thank you, Janice! I hope you do try; the kit is so easy to use! Thank you for reading! Quite simply a great read and inspires me to start one myself. Thank you!